Artificial limbs, such as prosthetic legs or arms, are a common solution nowadays for patients who have gone through the process of amputation. Prosthetic parts of the body are being used for such medical cases since the 16th century and as the centuries pass, their quality is dramatically improving. Due to this scientific and technological evolution, the capabilities that these prosthetics offer to the patients are still developing, in order to ensure a better quality of life. 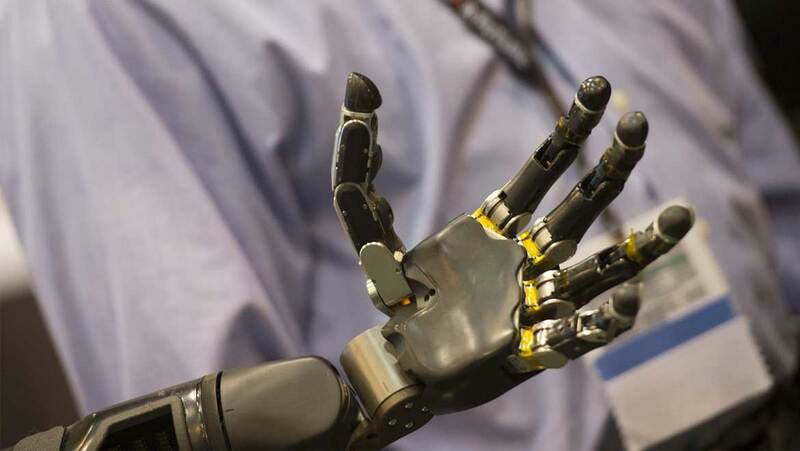 Researches have proven that the new devices that are now being manufactured take us one step closer to more natural control of artificial limbs. The function of these ‘new age’ prosthetics can be easily explained if we consider the way a natural limb works. Nerve signals from the brain and the spinal cord stimulate the muscle cells of a certain spot in our body in order to accomplish the movement. In the same way, for these sophisticated prostheses, scientists use electrodes to sense muscular impulses in the residual limb. Electronic control systems then detect these signals, before amplifying them to power electric motors that operate the prosthetic limb as though it were real. A special sensor can pick up nerve signals from the spinal cord and allow people to control a prosthetic arm by simply imagining the movement they want to make. In other words, the patient thinks "I want to move my arm," then their brain stimulates the muscles in the residual arm, the electronic system commands the electric motors to move and the prosthetic limb shifts accordingly. In order for the tests to take place, the sensor is surgically implanted to the patient, who is able to control his limb virtually in a screen which simulates the situation. The variety of movements offered is also larger than that of the existing artificial limbs. So far in the market we can find types of artificial limbs that can be controlled by flexing muscles in the arm or chest of the patient. Despite the positive prospects of this endeavor, there is still a limited amount of movements and commands that those limbs can achieve. This technology is only performing one or two grasping commands and as a result, complicated movements that require multi-muscular action can't be achieved. It is also worth mentioning that in Germany, at the University Medical Centre Göttingen a team guided by Dario Farina has developed a technique that can ‘translate’ signals directly from neurons in the spinal cord. Specifically, Dr. Farina explains that when an arm is amputated the nerve fibers and muscles are also severed, which means that it is very difficult to get meaningful signals from them to operate a prosthetic. The attempt of this new approach is based on moving the focus from muscles to the nervous system. This means that the technology can detect and decode signals far more clearly, so as to be more intuitive and useful for patients. Farina and his team tested this new sensor on six people, who have lost their arm from the elbow and below. The nerve signals had to be strong in order to be detected by the sensor, so the researchers had to surgically connect some nerves that where responsible for movements of the arms with chest muscles. Examining the ‘route’ of the same signal in patients that had both their arms, they realized that these signals can be used to reconstruct the movement as if the arm was present. So, as far as the virtual prosthetic is concerned, the amputees could move a virtual arm in a screen rather than the real prosthetic, with much more freedom than has been already achieved, with the help of physiotherapists who could teach them how to control the device by thinking about specific arm and hand commands. The potential usefulness of this innovation has been tested and as Silvestro Micera at the Swiss Federal Institute of Technology (EPFL) in Lausanne says: “It’s a nice piece of biomedical engineering that allows really natural movement.” As a conclusion, the researchers need to show it works in a bigger study and with an actual prosthetic so as to make this leap from “muscular-controlled” to “nerve-controlled” prosthetics in the future.